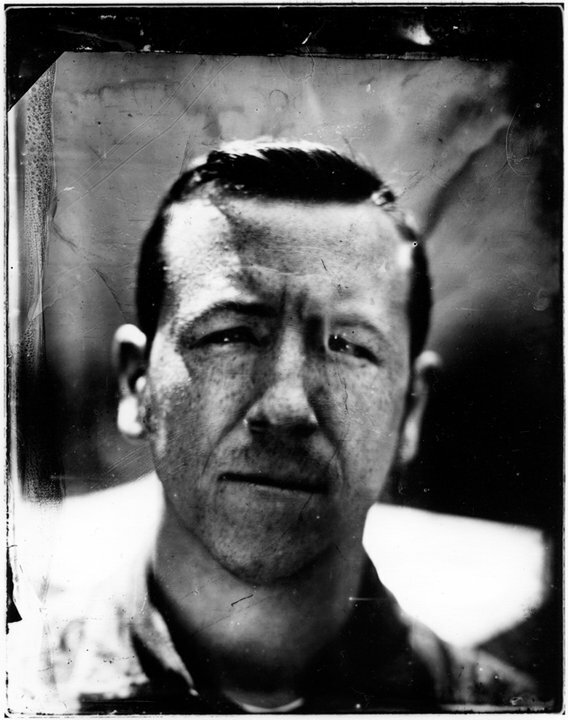 Terence Hannum is one of the founding members of HSS favorites, Locrian. Between Locrian and his solo recordings, he has contributed to a number of releases on labels that include Utech Records, Small Doses, At War With False Noise, BloodLust!, and the band's own Land of Decay. Terence is also a visual artist, actively creating paintings, audio and video installations, and artist zines inspired by heavy metal and religion. You can check his work out at http://www.terencehannum.com. I honestly do not think I would be making video art at all if it were not for Bill Viola, while I am not on board 100% with his entire output some of his early work was completely sophisticated for the video medium and delved deep into some intense content. Granted this piece is being made approximately 20 years after the birth of video so you find no navel gazing studio experiments, or performance documentation that plagues the early years. Rather a more poetic interpretation emerges, one that touches on a deeply human and religious theme. Artur Zmijewski is a Polish artist who has made politically intense video work for a while now. However his most moving, to me, has to be the quietly epic Singing Lesson 2 which has a choir from a school for the deaf singing Bach’s Cantata inside the Church of St. Thomas in Leipzig. The choir is joined by a baroque quartet and a professional soprano vocalist which adds the necessary contrast to their atonal vocalizations. It is honest and human, completely fragile yet bold. Ok, so it’s a film, 16mm to be exact. However it happens to be one of my all time favorite pieces. You can find it on DVD from Pythagoras. And it is worth it, I will also add that the original audio score is provided by the master, Kevin Drumm. There is a great intro and outro piece shot by helicopter in night vision, however what makes this film so compelling is the sequence of juxtapositions of suburban vignettes at night, still shots, no real motion punctuated by car alarms. Waiting for something horrible to happen,and expecting the worse in a suburban horror Vacui! I’ve been a fan of Gary Hill’s for quite a while, though this piece only recently came to my attention. There is a ton to like about this video, the wonderful voice over, the darkened table of bones, skulls, scraps, dead insects, etc. which we visually sift through by way of a stationary camera. Such a simple set up with profound results. I am a huge fan of most art having to deal with music. Anri Sala is an Albanian artist who uses music in many ways to analyze certain themes important to himl perception, space, etc. In Three Minutes two video channels are projected into a space projecting a cymbal moving under a strobe light at two different frame rates. Completely beautiful and alien without its sound source. The earliest work on my list, and again from Super8 film and transferred to video, but this piece is so upsetting and intense. Completely violating. It is just that, and it is a simple and captivating piece from this Chicago based artist. A massive tome about the intersections of religious fervor and rock music set to a soundtrack by Glenn Branca and Sonic Youth. This is perhaps one of the most influential videos on most of my body of work and I am still impressed at how Dan Graham weaves the Shakers with Patti Smith and post-WWII Suburbia and punk music into this captivating tapestry. It’s pretty phenomenal still. I saw this show at Andrea Rosen and it was so unsettling, bizarre and fascistic. Perfect addendum for the Modernist rigid fantasy, shot in the Mies van der Rohe pavilion. The severity of her shots and how she vacates so much of the frame really influenced my work and sense of composition. I went to school with Josh and was always in awe of the amount of work he would make and their level of comfort with the sociological, ritulstic, technologic and comedic. His short videos, often infinitely looped, are disturbing mantras worth your time. I have been a fan of Youth Attack more for the design than the music, which gets a bit monotonous after a bit, however it made so much sense to me that Mark would distill his visuals into the printed form and I have to praise both of these tomes, one out of print now. black and white. Wonderfully executed and immersive. A more typical zine like the ones I grew up with about music. However this is on great paper stock, deals exclusively with black metal and focuses more on design which is welcome. Welcome because I find most interviews, even ones I am a part of, to be completely underwhelming or cliche. Rather spend time listening to the music. I cannot emphasize how much I respect Marc Fischer and his art collective, Temporary Services. If we’re not talking about amazing music then he is exposing me to some art group I never heard of. So it is no surprise that his basement is a pseudo-gallery where he displays occasional shows of artists’ publications. This one is a huge eye opener about an artist whose practice was challenging, funny and open. Primarily using surveys to expose banal and profound questions about art and how we experience it. A bit pricey but this is such a heavy bow to the altar of the Xerox that you cannot ignore it. Totally degraded imagery, destroyed by their reproduction. Lovely, haunting, exquisite by one of the Xerox/zine masters. This compendium of dark arts has a wonderful line up and an excellent designer/ compiler, Scandinavian designer John Jansen. The first issue features Justin Bartlett, Demian Johnston, Mattew Adis, Max G. Morton, Scrmn, French, Rainbath, Lona Aalders & Experimental Jetset. Pretty impressive. Ultra limited and very cult. This guy is prolific and a quality photographer. I am always attracted to those committed to the printed tome in their work and Alexander does not disappoint. His dark photos of hooded figures, bleak landscapes and rainbows emit a sense of control and vision I have yet to see. Find his work and own it. So most of the work I like is super dark and bleak and disciplined, but this zine with a horrible title has completely fascinated me. Excellent printing chock full of awesome artists. It is total design vomit but its abjection is what makes it curious and attractive. Recently was turned on to her work by the repress of this book of her photos. Figures, landscape, hair, enigmatic tattoos, sigils of bone stated bluntly and bound. I wish I had known of her work earlier to pick up her hand bound editions which also look intense. Pick up the reissue. So I have to recommend some great places to find out about books, since it is a weird medium to traffic in. However there are many more places to get things, or find out about stuff that comes out. I would begin locally, being based in Chicago I have to put up Quimby’s (http://www.quimbys.com) a zine/book/indie shop, and add a more recent space/mini-gallery called Golden Age (http://www.shopgoldenage.com) whose curators/shopkeepers always have a nice suggestion and give a plug for Western Xeditions (http://www.westernexhibitions.com/westernXeditions/index.html) a small shop of artists work (including my own). A great place for artists books and editions are two classics; Printed Matter (http://www.printedmatter.org) in New York City, Art Metropole (http://www.artmetropole.com) in Toronto, Canada. I also enjoy this young whipper-snapper space called Family (http://www.familylosangeles.com) in Los Angeles. I would also like to add one more online location Self Publish Be Happy (http://www.selfpublishbehappy.com) which showcases books they like and have a pretty impressive shop. this blog is just getting better and better. what an awesome list. thank you.